The resort is located in South Goa, Cavelossim, it may be pertinent to add that South Goa is considered to be the pride ot Goa. 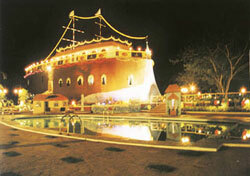 The resort is built on an area of 68000 sq. mts. having tremendous scenic beauty. The uniqueness of our resort lies in having Mobor beach on one side and River Sal on the other. Considering the emerging needs of the customers "The Old Anchor" has been recently renovated and refurbished. Presently the resort has 124 well appointed air-conditioned suites in different categories. We also have a centrally air-conditioned and fully equipped Conference Hall offering permutations from 25 to 100 persons. The resort has facilities like Multicusing restaurants, Bar, Swimming pool, Health Club and well developed picturesque gardens. We organize events for guest's entertainment besides providing activities galore. Snuggled between the tranquil River Sal and the turquoise Arabian Sea, "an oasis of exotic splendour" welcomes you to live life with a passion! With gourmet's delightful culinary creations at Rancho-our Coffee Shop, Adega Goana Bar and the pool side Bar-be-que. Banquet & Conference Facilities, Swimming Pool, Sauna, Jacuzzi, Ayurvedic Massage, Evening Entertainment, Discotheque, Gym, Billiards Room, Doctor on call, Laundry, Travel Assistance, Car Rental, Money Exchange. The resort has 124 well appointed air-conditioned suites in different categories.